wow, everyone keeps on going cooking Dutch food! I love it! The one on the right is 2 years old, it's made in the Dutch province Noord Holland (where Amsterdam is). The one on the left is 3 years old and made on the farm Elisabethhoeve in IJsselstein, a town to the east of Amsterdam. You can see the crystallization in the cheeses.. both are delicious, with a salty but mellow flavor, very rich and buttery in your mouth. The 3-year old has a slightly more concentrated flavor and the texture is a bit harder and drier. This is a very concentrated applepaste (about 3 kilo of fruit went into this little jar). 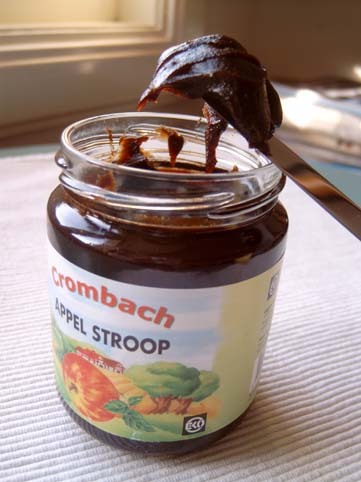 The hilly landscape you see pictured on the jar is what the province of Limburg, where this appelstroop is made, looks like. The applepaste will also feature in tonight's dinner, in a recipe from that province. Thank you for the cheese pics! The three-year old cheese does look very close to the cheese that I ate a few weeks ago. I'm visiting my friends again for New Years, so I'm hoping to get some more of that cheese then. 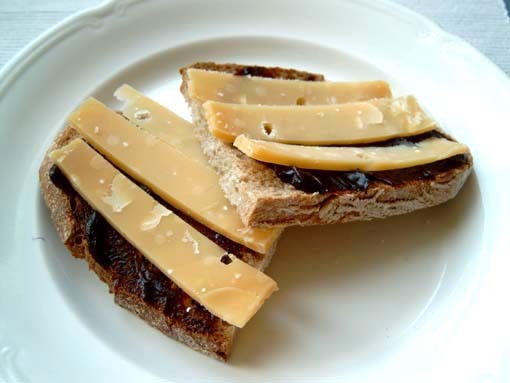 The appelstroop looks similar to what we call apple butter or apple cheese here. Does it have sugar and spices added to it? Dutch Apple Pie was at our Thanksgiving gathering as well. Everyone loved it! I'll try to post some photos soon. I looked at the jar, and it seems it's nothing but applejuice, cooked down until it's a paste. No sugar or anything added. It has a tart, very deep flavor. These pictures and recipes are so, so, so fantastic. The appeltaart in particular is a standout. 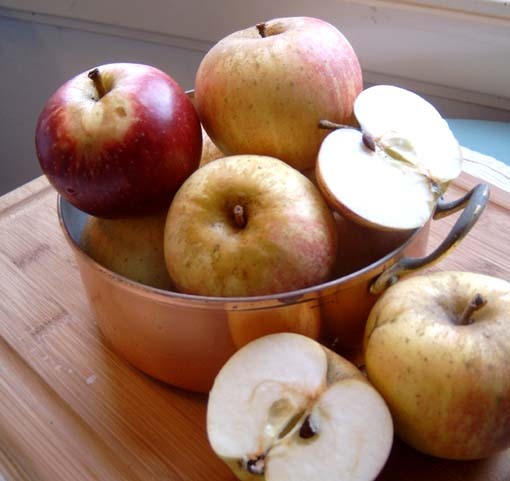 Is there a dish in Dutch cooking called appel skivvers or something similar? Little balls of dough with apple in them? You have to buy a specialized griddle for them. My mom bought it a few years back and made them and they're quite a production! Today it's time to broaden my horizon a bit and leave the farmland surrounding Amsterdam - where both my parents grew up on farms, and where many of the recipes so far have been coming from - and the province of Friesland, which I have a particular fondness for, maybe because my father's ancestors are from Friesland.. anyway, today I'm looking south. I think we spoke about the province of Limburg upthread.. Limburg is traditionally seen as the most 'burgundian' province of the Netherlands.. it is a predominantly catholic province and the people there are known for their food and ofcourse their beer.. many good beers are being made there.. maybe I should write about them also some day. Melt the butter and slowly, thoroughly brown the rabbitpieces. When they are nicely browned, add the chopped onion. Cook for a couple of minutes until the onion has softened. Add the bayleaves, sugar, vinegar and water to the pan. Let bubble for a bit, then turn the heat to low and simmer the rabbit over very low heat until tender (about 1 hour should do it). and cook for a minute or so until the sauce has thickened a bit. 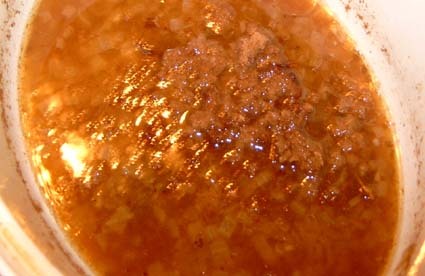 Turn the heat to low again, add the appelstroop to the sauce and stir until melted. Taste for salt and pepper. 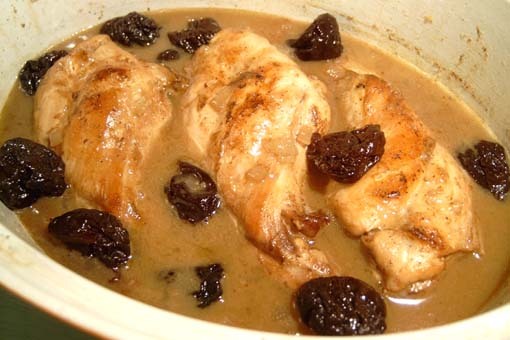 Put the Rabbit back in, add the prunes and serve (or reheat later). 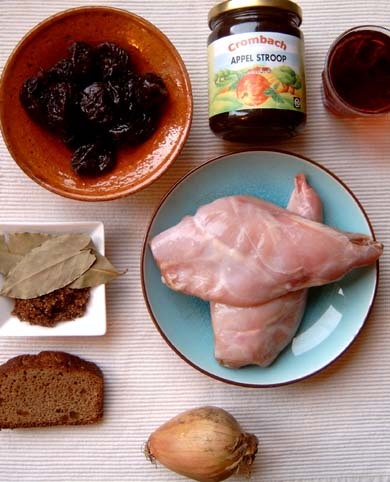 I served this with Hete Bliksem, 'hot lightning', a mash made of apples and potatoes. 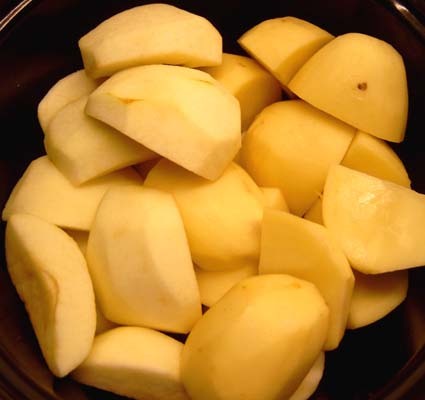 The 'hot' part does not refer to spicyness, but to the fact that the apples retain the heat much longer than potatoes, so this is a mash that can burn your tongue! However I have seen many recipes that use other kinds of apples, or even pears. 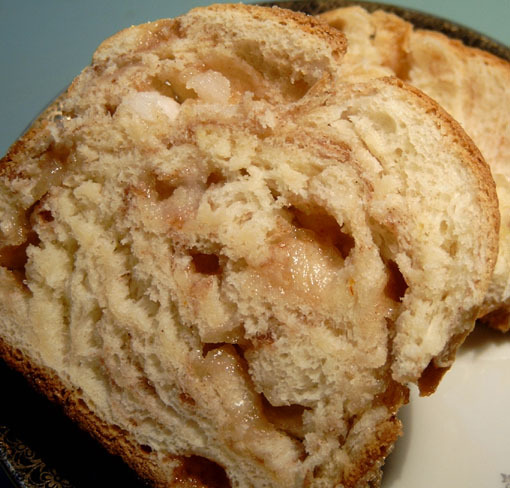 Use any kind of firm, not too tart apple and this will taste great. 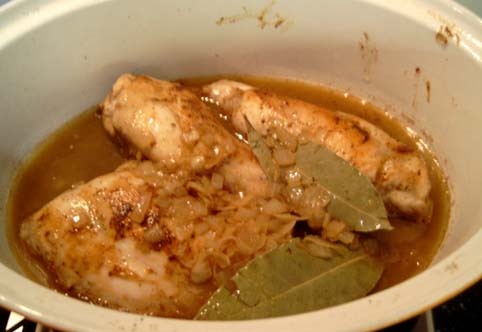 Cook in salted until tender, then mash together with a knob of butter and a splash of milk. I like it best when not too thoroughly mashed, it should still have some texture. The sauce was really good, quite tart but with a lovely depth of flavor. I had never used gingerbread to thicken a sauce like this but it was great. ideally you should not use a gingerbread that has pieces of ginger or citron in it, but I just picked them out of the slice I had left from last week, thinking it would still be better to use my own homemade bread for this! now.. apple skivvers that does not really sound like a Dutch word to me..
are you sure that's a Dutch dish? Could you tell me a bit more about them? It was a phonetic spelling. I've Googled it and can't come up with anything close. You make a batter, spoon it into a round mold, mound slivered apple over the top, and then cook until golden. Then you carefully flip it in the mold so that the whole thing comes out perfectly round. Man, this is no help at all. Just the spelling of "appel" upthread got me to wondering. I'll ask Mom about it and come back. 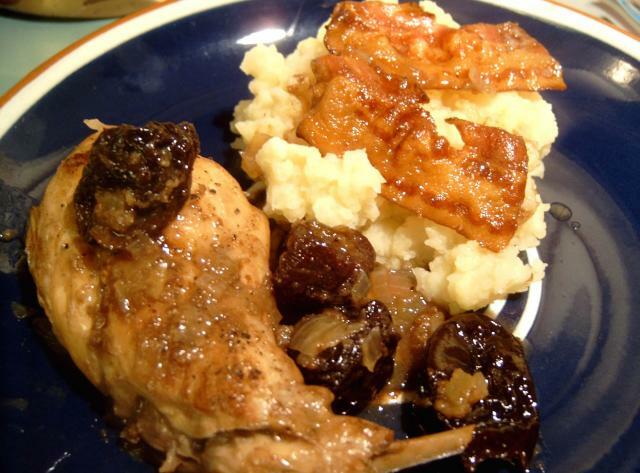 Holy crap that rabbit dish looks great! And I love crumbling the gingerbread into the sauce! The Danes make abelskivvers, which are spherical "pancakes" cooked in a pan with hemispherical indentations. My DH's Danish grandma has promised to give me her abelskivver pan someday. . . I make that apple and potato dish too, in its German incarnation, where it's called Himmel und Erde, Heaven and Earth. Onions and bacon, sauteed together, make up the topping. It's peculiarly delicious. 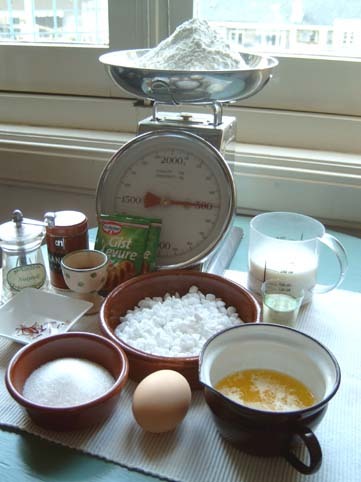 And now that I think of it, using the gingerbread as a thickener seems German too, since lots of Sauerbrauten recipes call for gingerbread, or gingersnaps. That's a thing we don't do in my part of the world, thicken gravies with bread or cookies. I wonder why not. And yes, aebleskiver can have apples in the center, or jam, or be eaten just plain. The pans are available online - just Googling I see that you can get one here. They say not to use them on a flat top electric stove, by which I assume they mean a glass or ceramic top. That's what I have, and although I haven't made any aebleskiver for a long time, and maybe not on this stove, I've never thought that it would be a problem. Does anyone know what the issue would be? I think the concern is that the heavy cast iron would scratch the top of the stove. The abelskivvers should turn out just fine. Thanks for the help, azureus. Sorry for the confusion then. I make that apple and potato dish too, in its German incarnation, where it's called Himmel und Erde, Heaven and Earth. It's called that ("Hemel en aarde") in some areas of the Netherlands as well. What kind of apples do you use for it? Klary, what are the names of the 2- and 3-year-old cheeses? Both are Gouda cheeses. (they don't have to be made in Gouda, to be called Gouda). This is the most common cheese over here. Flavor differences come from the style (factory cheese or made on the farm from unpasteurized milk) and age: the difference between a 4 week old cheese and a 3 year old, is ofcourse immense! I use Granny Smith apples, which I don't think are good for much else. They're large, green, hard, and tart. When I learned to make the dish I was told that you need a really tart apple, and they sure are. It's sad, but we don't get very many varieties of apple here. I'm really getting into your speculaas spice mix. The other night I made some little pumpkin and marzipan tarts, using it instead of the usual pumpkin pie spices. It's such a good mixture. I just want to report, I am currently making your "Butter Braised Beef" for lack of a better term. I am absolutely following your directions and the aroma is amazing. I was able to get a really nice chuck (beef shoulder) steak at the market that looks pretty much like what you cooked. Yes, it was very hard to not mess with the seasoning but I refrained. Two bay leaves and two cloves. The smell is amazing. I will probably eat this tomorrow and I see some mashed potatoes in my future. we're going north again.. to Friesland, to make one of the specialties of that province: Sukerbole, Suikerbrood, Sugarbread. Somewhere between a cake and a bread, this is a lovely loaf with crunchy-soft bits of sugar melting in a sweet white bread dough, very faintly spiced with cinnamon. To be authentic you should use soft sugarchips ( I think these are known abroad as pearlsugar), I could not find them anywhere in the regular stores, and ended up buying a large bag from a local bakery. You could substitute crushed lumps of sugar, only make sure that the lumps aren't crushed to a powder because you want texture and crunch in your finished loaf. Lots of butter and coarse sugar for your tin. 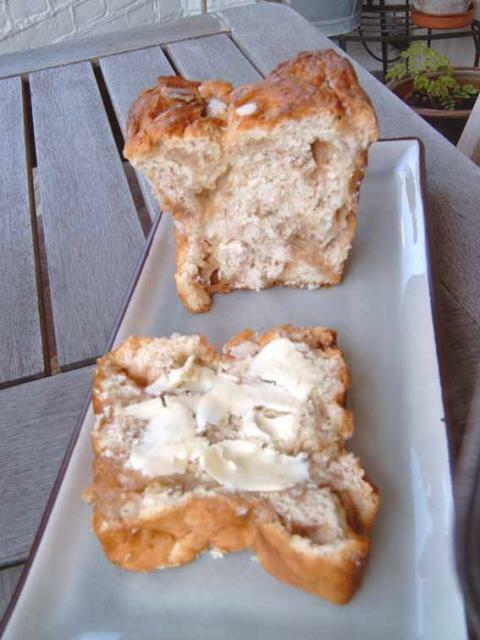 Loaf tin: this recipe is for a 2.5 liter bread tin. I don't have one so I used a 2 liter cake tin for most of the dough, and baked the extra dough in a small round cake tin. 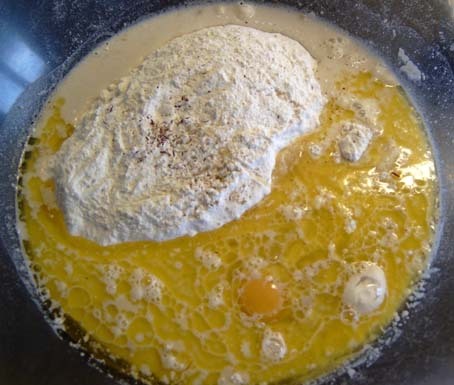 Mix the flour and yeast. Add the rest of the ingredients except the sugarchips and cinnamon. 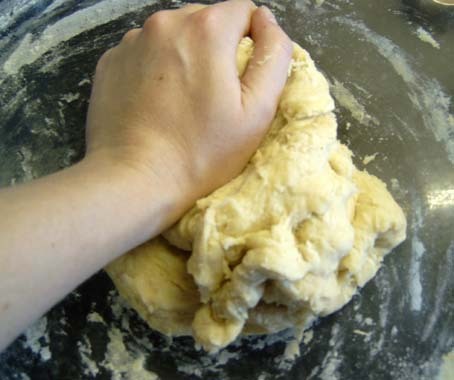 Mix to a dough. 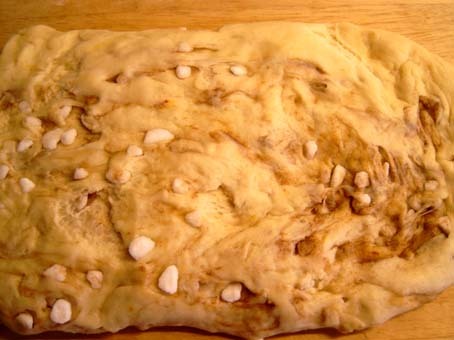 Knead the dough for about 10 minutes, then set it in a warm place to rise for about 1 hour. Mix the sugarchips with the cinnamon. Very thickly grease your tin with butter, and sprinkle with coarse sugar. 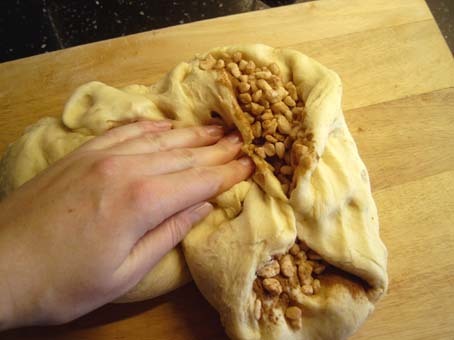 Punch down the dough a bit and start incorperating the cinnamon-sugarchips into the dough. Now the important thing is to not mix this too much. 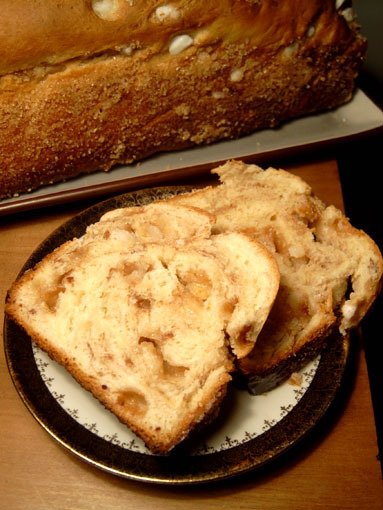 You want the finished loaf the have sugarlumps distributed unevenly through it, and you want ripples of cinnamon. 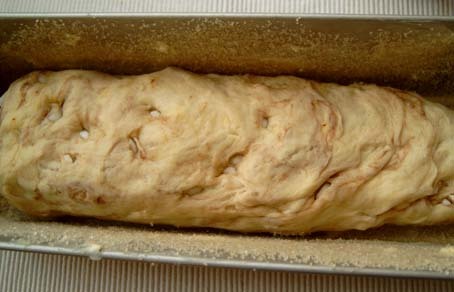 Press the dough into a large rectangle, about the length of your loaf tin. Roll it up. 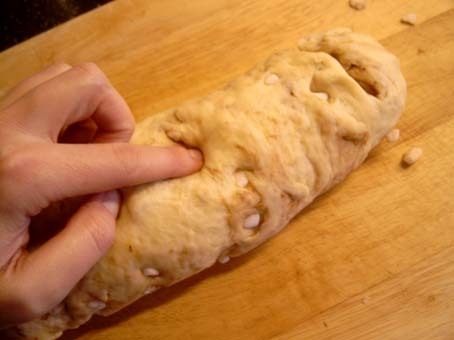 Now push back the protruding bits of sugar into the dough. 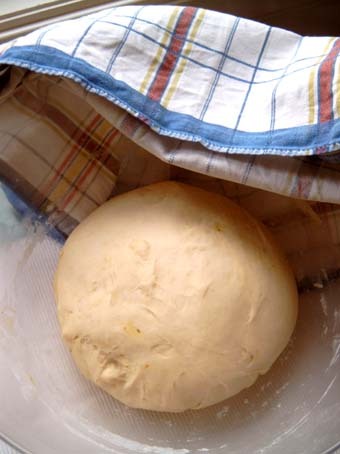 Place the roll of dough into the tin, cover with a cloth and leave to rise for another 20 minutes or so. In the meantime preheat the oven to 200 C / 390 F.
Sprinkle the loaf with a bit more coarse sugar and bake for about 25-30 minutes. edited to add: here's one I bought in Harlingen, Friesland, earlier this year when I was on a weekend trip there. I think I came pretty close!! Oh, my - that looks delicious! It's like the uber-cinnamon-sugar toast. We brought back three Dutch cheeses and I would love some help with getting more info on them if possible. 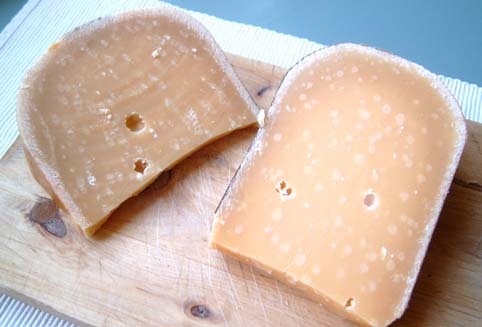 I believe the first cheese is what De Kaaskamer gave us to sample at the shop that was similar to Reypenaer. It is a wonderful aged cheese that was a bit les salty than the Reypenaer. Noord Holland is a province (stretching all the way north of Amsterdam to the North Sea). Without a more specific name, this could be from anywhere in this province. Noord Holland is famous for its cheeses because it has so many meadows for the cows to graze.. Extra oud means that it's at least 1 year old, but hard to say how old! Could be much older..
Petit Doruvael: I had never heard of that! here's the website of the farm that makes it. They are the only farm in the Netherlands allowed to make a red-rinded cheese (apparently there are very strict sanitation / health regulations for making red-rinded cheese). Sounds like an interesting cheese, maybe I should go and get me some! yes, I think it would. 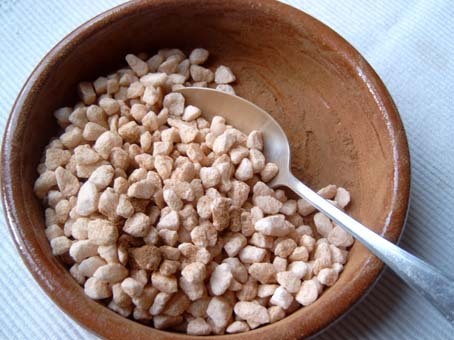 I even think it would be better than the "crushing the sugarcubes" trick, because it is the texture of the little clumps of sugar that is the most important, not the size. thank you, again, for your kind words. as for the cookbooks. I have been thinking about that. There are some good books on Dutch regional cooking, but only in Dutch. I think that the books meant for the international market tend to be more of the touristy kind. You know, with lots of talk about cheese and stroopwafels and fries (now, not that there's anything wrong with those ), but good simple home cooking is probably thought of as not flashy or interesting enough. Whereas I thought, that exactly these types of dishes would be interesting to EGulleters. Beautiful! I have the Swedish parlsocker (imagine the umlaut over the a), which I think is what Anita probably has too, so I'll try it with that, maybe for Christmas morning breakfast. 150 gms of sugarchips appears twice in the filling ingredient list - it's just one batch or 150 grams, right? Did you steep the saffron in the warm milk?